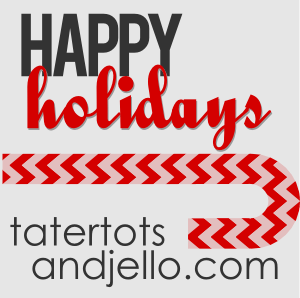 Hi Tatertots and Jello-ers! 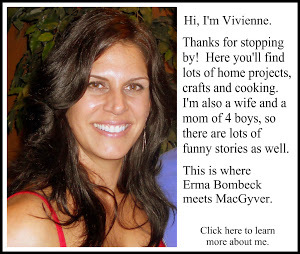 My name is Vivienne and I share tutorials, recipes and assorted funny stories over at The V Spot. 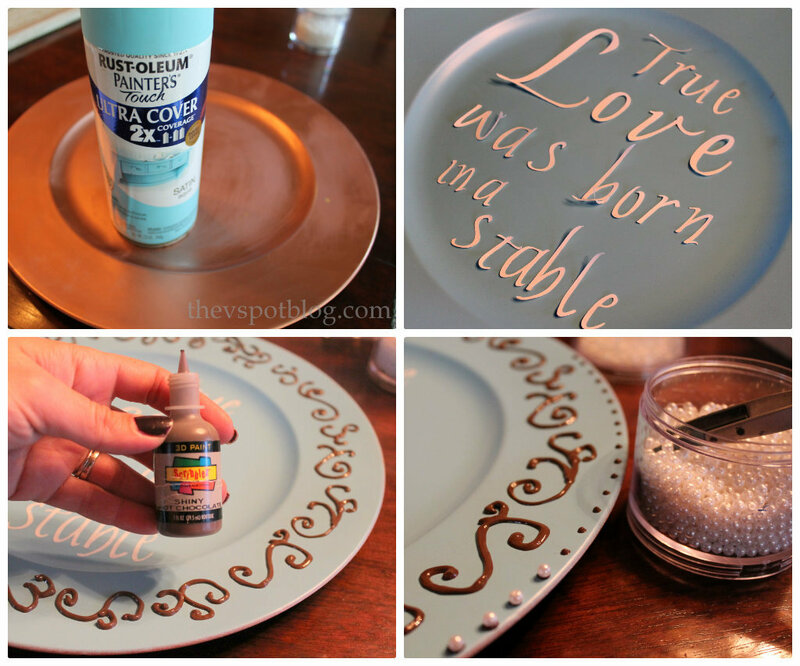 I was so excited when Jen invited me to share a holiday craft with you! It took me a while to decide what I wanted to make. You know what happened…? It did NOT go according to plan. 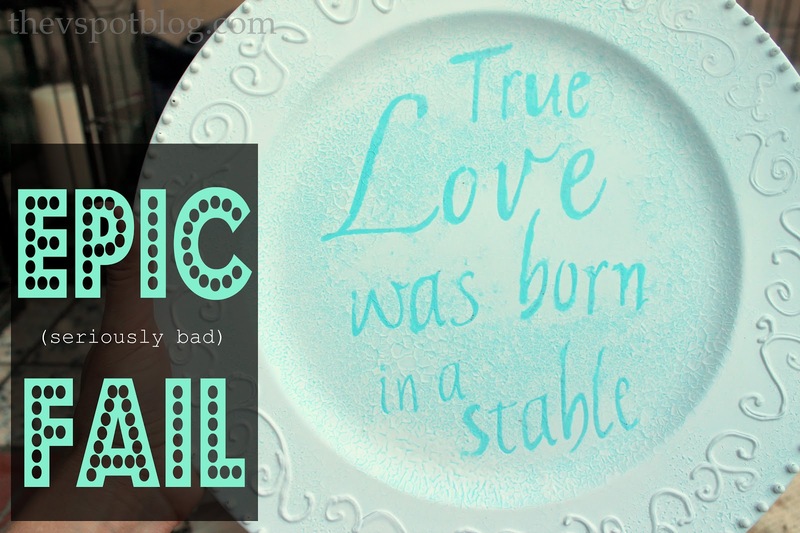 Today I’m going to show you a very realistic side of crafting, and how sometimes you discover new things while creating your biggest flops. I call it Problem Solving Creativity. I change up my Christmas colors every year. Last year was red and gold, and I made this artwork to use as decor. 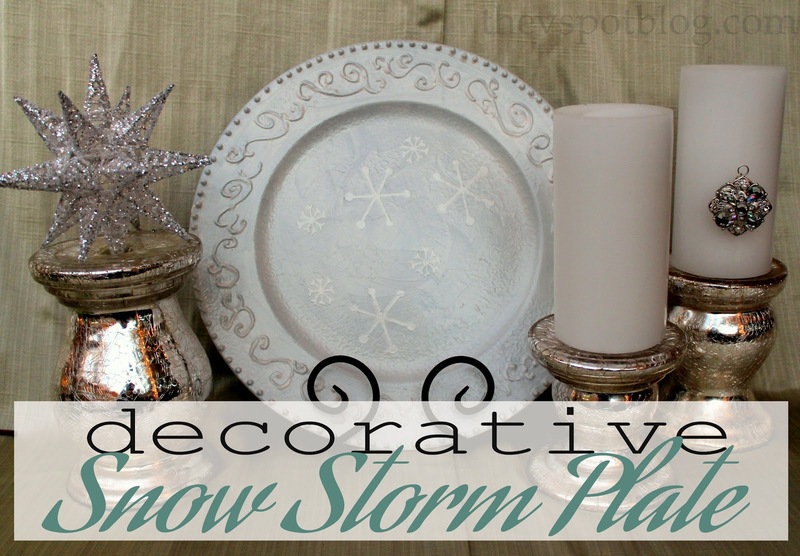 I loved the saying, but it wouldn’t match this year’s colors of blue, green and white, so I decided I would make a decorative plate that said the same thing. Here’s where it all started to go terribly, terribly wrong. 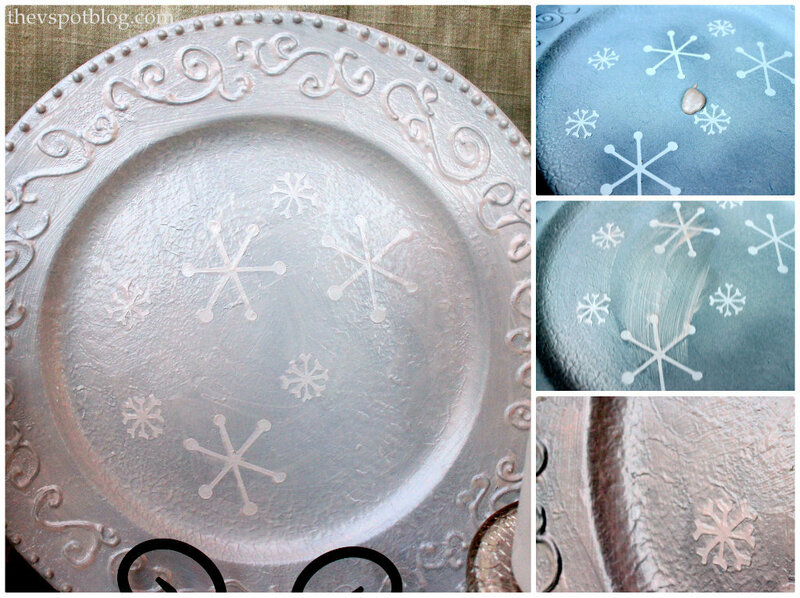 I took the plate outside to spray the whole thing with a nice glossy white paint. Um, no. Seriously, I feel like sometimes every single project is a narrowly averted craft fail. I love that you showed that sometimes projects don’t turn out the way we have them in our heads. And if we just persevere and use our imaginations, we can come up with another solution. Your plate turned out great!! 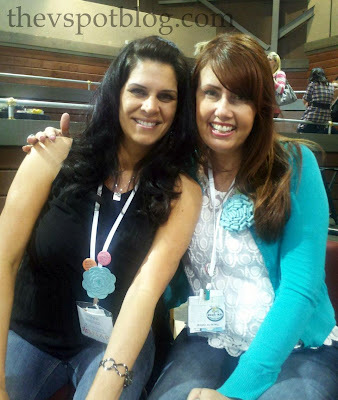 Viv is one of my first blogging friends. From the beginning I was so impressed by Viv’s warmth and sense of humor. 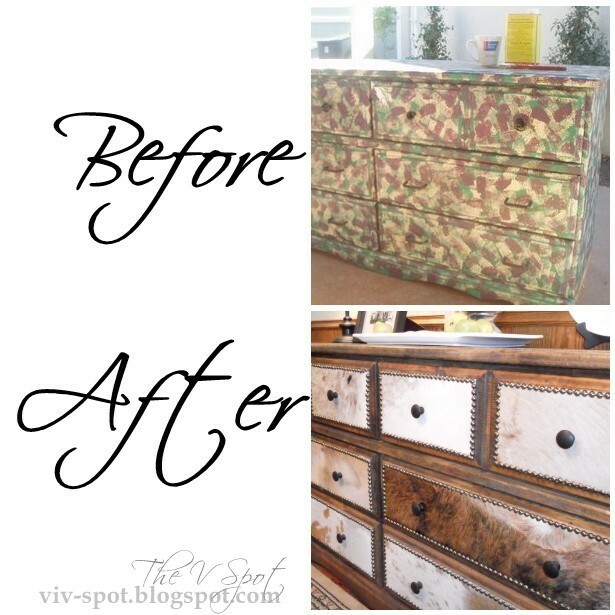 And then I discovered her ability to transform anything into something fabulous on a budget! And, she is an amazing entertainer. Her parties and tablescape ideas are so so beautiful. Here’s an example of Viv’s entertaining skills. 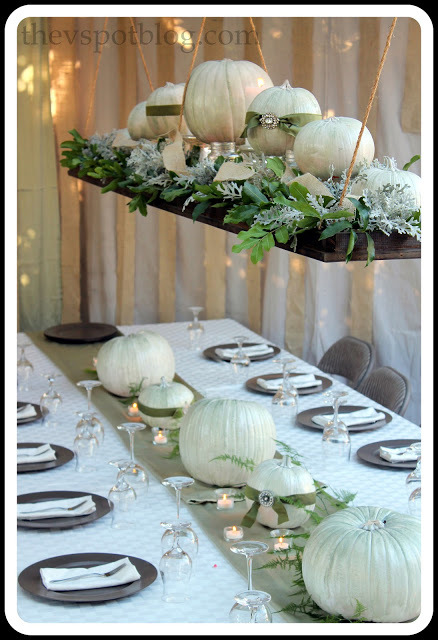 Not only does she make a beautiful table and centerpiece, but she also makes a hanging Thanksgiving Centerpiece. Amazing. 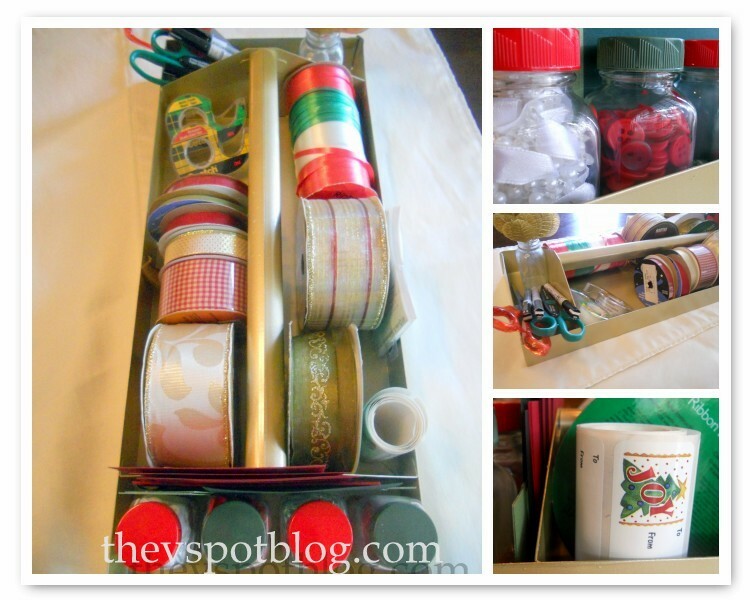 And what a great idea for this time of the year — A Gift Wrapping Caddy. Viv shows you how to make one. Plus, if you like camping (or even if you don’t, like me) — Viv’s camping tips and ideas are amazing. Almost time for the Weekend Wrap Up Party. I love to feature YOU. I hope you can stop by for the fun. Weekend Wrap Up Party — and Decorating Cookies Book Giveaway!! LOVE IT!! Viv is awesome. 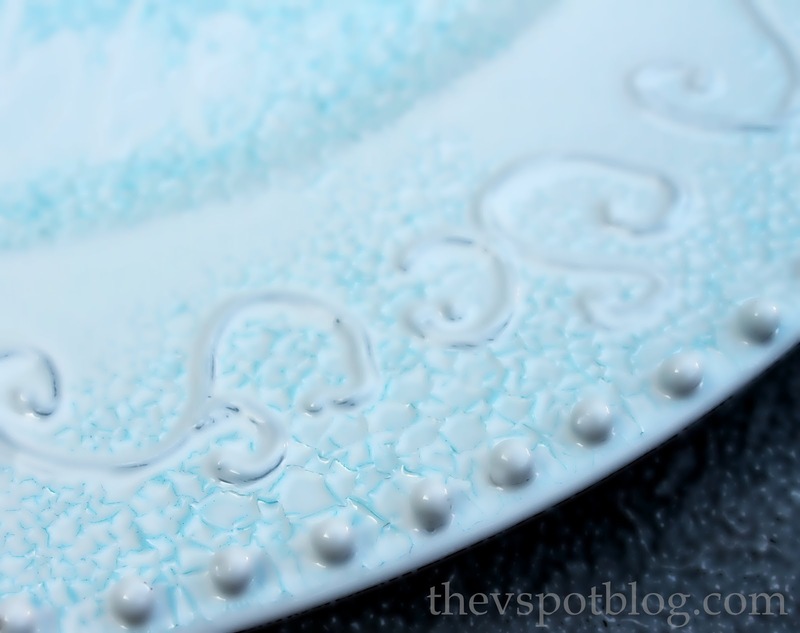 I seriously appreciate a crafter who will show off her mistakes and how it turns around. Makes trying new things so much more accessible! 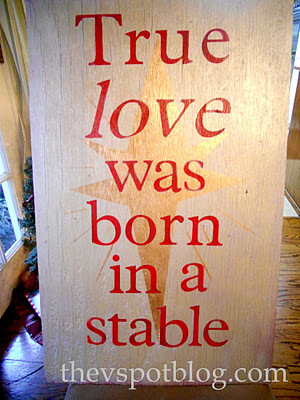 Viv, I love your “True Love was born in a stable” piece from last year; wish you could just change the colors on it! 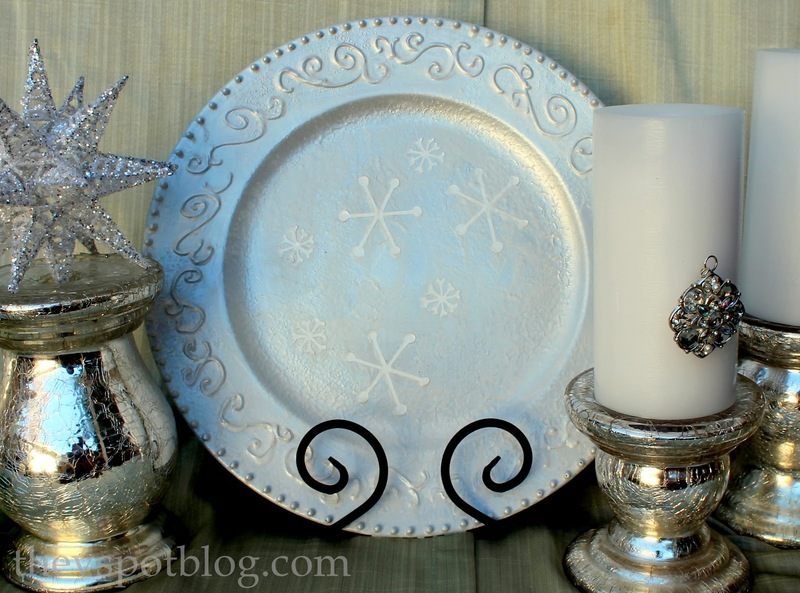 But I think the plate turned out just great–fun and festive! I guess that’s the only kind of snow you get in SoCal, huh? I love that you showed your ‘oops’ – my next post is going to have to show some ‘oops’, too. And I love that you used that cheer! I have to borrow it, ok?? Great post, loved it. Great personality. Joining now.